﻿Apparently, the Michigan Humane society is helping kittys find forever homes by helping people adopt them like they would get one of those car thingys. They're called "MHS Certified Pre-owned Cats". These kitties get a multi-point inspection (does that mean they are meezers?) and they have a 100,00 purr warranty. (heck, I got at least half a million purrs on me, and I look like new!) they come with GPS (or I guess that's what the microchip is) OnStar (24 hour online assistance) and $40.00 down financing. According to the men on the TV's that talk about it, it's an exciting, good thing. And, to help support our economy, all these kitties were "Made in Michigan". (So were we!) It is a sheer genius campaign, and should help a lot of these kitties to find new forever homes. If you can, stop by their website MHS Pre-Owned Cats Program and spread the word(or if you are in, or know someone in that area, get them into a new kitty)! Thanks for coming to visit Dante! He always likes to meet new furiends. And wow! Is that ever clever! You've gotta speak the language of the CATsumer, that's fur sure. We think that's very clever too, and hope this "marketing" strategy is successful! That is way too cool! Happy weekend everyone! Thanks so much for visiting our blog. We are thrilled to meet you and love that Kitty Car. We sure hope it helps to find some kitties their forever home. We are all for that. Take care and have a great week end. Those are awesome cat cars! We might maybe allow ourselves to be seen in a car if it looked like those. Well..... maybe! Thank you for stopping by, and for your nice comments! The mom here know about Detroit. Many years ago she worked up there. Also, Detroit is known as the MoTown. Lots of 60's music!!! 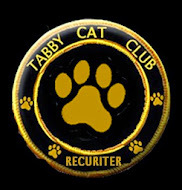 The mom here worked for me and your Tabby Cat Club badge is on the way. Welcome to the club. I am excited to have you as a member and looking forward to getting to know you better. Pre-owned cats. We hate that so many talk about shelter animals as if pre-owned is a bad thing. Lots of good animals in need of homes. PS - Welcome to the Tabby Cat Club. We love those kittycars! We'll take a tabby and a meezer one please! We hope the Pre-Owned Kitty campaign works, we like it. My human would look great with one of these two cars btw. WOW!!! Those Cat cars are cool and we hope they find lots of kitties homes! Hi there! Jonesie says that of course you can join the Society of Feline Gardeners. All are welcome! All you have to do is say the super secret password "meowwww" and your in! You can use the badge on your blog if you like. If you don't know how to copy it, let us know and we'll email it to you. I think this is a great idea to promote kitty adoption! I once saw a commercial along those lines, it was like a used car commercial only featuring cats.